The Rasmussen Company specializes in custom corrosion resistant process equipment, including heat exchangers, from titanium, nickel alloys, tantalum, niobium, or zirconium. · Cross contamination prevention. Tell-tale port construction acts exactly like double tubesheet designs to eliminate the possibility of cross contamination. · Complete drainability. Flushmount tubesheet technology eliminates liquid hold-up, assuring complete drainability. Flush times are greatly reduced for increased productivity. 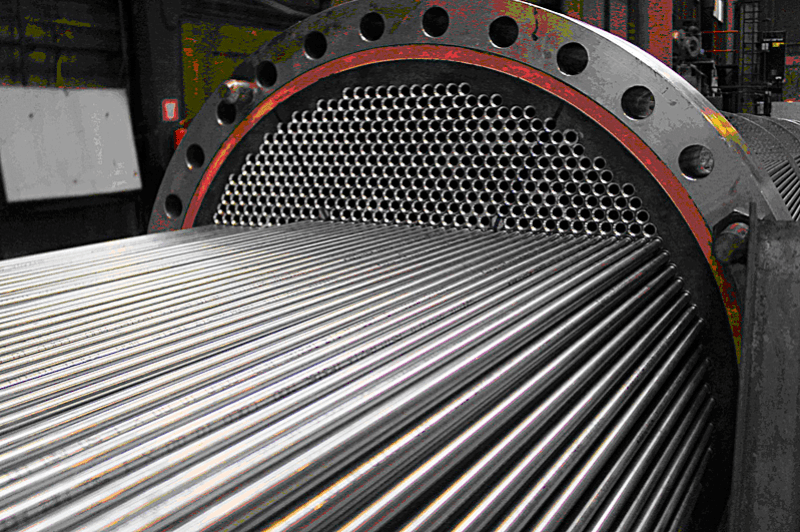 Titanium heat exchangers are typically used in, but not limited to, applications involving chlorides and hydroxides used in bleaching processes in the paper industry, oxidative environments, nitric acids, and chromic acids. Titanium is also virtually inert to the effects of salt water. Nickel alloys exhibit exceptional corrosion resistance and strength in a wide variety of applications. Nickel alloys are suitable for a wide variety of applications due to the many different compositions and properties associated with the different alloys. 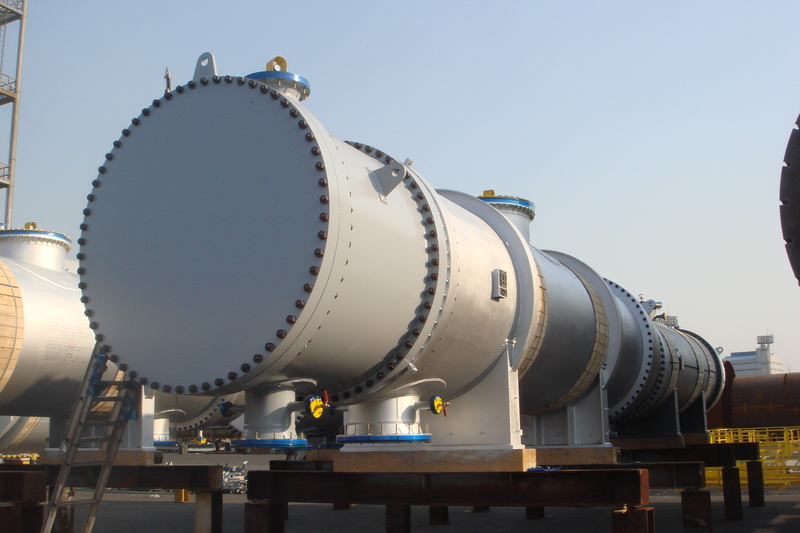 The Rasmussen Company specializes in shell and tube type heat exchangers, . Contact the Rasmussen Company with your inquiry for custom equipment made from a nickel alloy. The Rasmussen Company also specializes in custom heat exchangers made from tantalum. The most common are shell and tube type heat exchangers, but others types, such as immersion heating coils, are available. Tantalum is extremely corrosion resistant in a wide variety of demanding environments including nearly all organic and inorganic compounds in the pharmaceutical and chemical process industries. · Naturally occurring oxide film on tantalum’s surface makes it resistant to corrosion in even the most severe acid environments and completely resistant to organic compounds. Due to their much longer service life and maintenance free operation, tantalum heat exchangers are more cost-effective than equipment made from nickel-based alloys, impregnated graphite, or other materials. Because of its strength and workability, tantalum can be used in thin walled tubing for multipurpose helical coils, shell and tube heat exchangers, and bayonet heaters. This yields higher thermal efficiency, requiring less heat transfer surface. Thin sheets of tantalum can be clad in heating coils and tubesheet facings for the most cost-effective use of the metal. · Cross-contamination prevention. 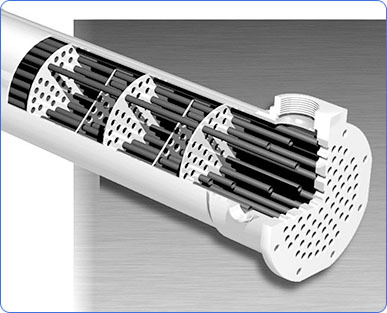 Tell-tale port construction acts exactly like double tubesheet designs to eliminate the possibility of cross contamination. · Maintenance-free operation. Downtime and scrapped product are prohibitively expensive. The corrosion resistance of tantalum, and design features, such as silver-brazing tubesheet liners, virtually eliminates maintenance down time and equipment failure. Tantalum is essentially acid-proof, except for hydrofluoric and fuming sulfuric acids. At temperatures under 300°F, it is inert to all concentrations of hydrochloric acid and nitric acid (including fuming), 98% sulfuric acid, 85% phosphoric acid, and to aqua regia. Tantalum is also completely inert to body fluids. In addition, it is fairly resistant to dilute alkaline solutions. Tantalum’s resistance to oxidation by various gases is also very good at low temperatures. Tantalum-tungsten alloys containing more than 18% tungsten are inert to 20% hydrofluoric acid at room temperature. These alloys are also somewhat more oxidation resistant than pure tantalum. They also appear to have the same corrosion resistance as pure tantalum. Contact the Rasmussen Company to find out more about Tantalum. The Rasmussen Company specializes in custom heat exchangers made from zirconium. They most commonly fabricate shell and tube type heat exchangers, but others types are available. Zirconium exhibits great resistance to high-temperature water and steam. Zirconium also exhibits excellent resistance to most organic and mineral acids as well as alkaline solutions and alkalis. It is particularly useful in contact with sulfuric and hydrochloric acids. Zirconium equipment is suitable for processes that cycle between acidic and basic conditions, being corrosion resistant over a broad range of pH’s. It is also excellent when used in service with reducing environments. It is also immune to crevice corrosion in chloride solutions. Contact the Rasmussen Company to find out more about Zirconium. SIC heat exchangers are an alterative technology in highly corrosive applications versus glass, graphite, or not-so-conductive teflon units. The extreme hardness, high theoretical density, excellent strength properties, and absence of free silicon make SIC advanced ceramic inherently corrosion and erosion proof. • 100% resistant to thermal shock and erosion damage throughout its operating range.